Have you ever trekked through a dry desert or backpacked through a rainforest? The main difference between the two is the amount of humidity present where a desert has little or no water content in the air while the rainforest is steamy due to water vapor. Hygrometers are specially designed to measure the amount of humidity in the atmosphere. As a weather person, gardener or just an outdoor lover, it’s always important to know the amount of water vapor out there to help with planning. Humidity is measured in two ways; the relative humidity and the specific humidity. Relative humidity is measuring the amount of water vapor in the air compared to the maximum humidity that could be at that particular temperature. Specific humidity is the mass of water vapor per kilogram mass of air. Now that we know what to look for when measuring humidity, let’s look at these special weather instruments known as hygrometers. These devices have come a long way since the early years when a strand of hair was used to determine the amount of water vapor outside. Now, there are various types of hygrometers that are being used at home, offices, farms and commercial setups. In here, we have compiled a list of the best hygrometers available in the market today that will give you precise and accurate measurements for all your needs. For near perfect humidity and temperature readings in your indoor space, then this hygrometer will get the job done. The accuracy of the readings are ±2~3%RH for humidity and ±1°F for temperature. It can also measure a humidity range of 10%RH and 99% RH while the temperature range is between -50°C and 70°C. TP50 hygrometer is designed to give you daily updates of the previous day’s high and low readings. 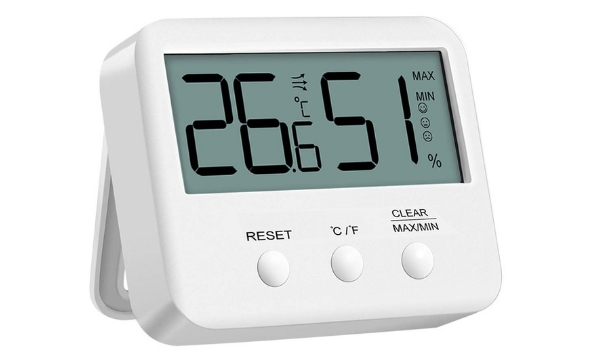 Even better, this hygrometer comes with highly sensitive humidity detector marked dry, comfortable and wet that will quickly let you know how comfortable the room is in terms of the humidity level. It comes in a compact portable design with a 2.7’’ digital display screen. Has a magnet at the back so that you can easily attach it to a metallic surface such as a refrigerator to quickly glance at the readings and omes with a kickstand that allows you to place it on your desk at an easy to read angle. You deserve the best living conditions in your home and this can be greatly enhanced when you know the amount of heat and humidity in the space you are living in. This digital indoor hygrometer and thermometer will help you achieve that with a temperature range of 0°C to 50°C and a humidity range of 20% and 95%. The hygrometer is highly reliable with a fast response rate every 10 seconds with 24 sensitive vents that help provide you with accurate information. The device comes with multiple mounting options such as a magnet to attach on metallic walls, a kickstand to place it on a desk or a wall mounting design. The gadget is also easy to read without any complicated function button. It also has a clear LCD reading so that you can quickly get the readings even from a distance. Comes with free batteries. It’s essential to know the indoor humidity and temperature in your home and this Pro Accuracy gadget will help you with that. Designed to give you professionally accurate readings of -/+2%RH, the hygrometer measures humidity and updates it every 10 seconds by displaying it on the digital display. It also has the option of manually calibrating the readings to update them. You can do this through an easy to follow manual that comes with the product. It also has a humidity level indicator that gives readings that fall in the range of 1% – 99% RH that are displayed in bold numbers that can be viewed from far. It has a colorful display bar that has blue for low, green for okay and red to indicate high humidity. You can also enjoy multiple mounting options such as the magnet at the back, a kickstand mount or wall mounting option. Designed to easily pair with mobile apps on Android and IO, this hygrometer is a new generation device that allows you to monitor humidity and temperature remotely. The free app supports multiple languages and provides temperature readings in both °C /°F mode. Better yet, the gadget can be connected to several phones at the same time allowing all members of the family to keep tabs of the humidity levels. The data record can be adjusted while you can get to select the scenario and add your desired scenario. The alarm and data view history are also available. The unit comes with two CR2032 that have a maximum battery life of 3 months. The wireless range for accurate readings is 50 meters and one 3M paster. Packed with high-grade sensors, the TP65 will provide you with highly accurate readings to help you monitor your indoor and outdoor temperatures and humidity. The gadget has user-friendly features such a backlight for easy night readings. It also has a sleek touch screen display for added convenience. It also gives you reading for the previous 24 hours for better monitoring. Has a transmission range of 200 feet or 60 meters. To reset the readings, you just need to press a front-facing button and you are good to go. The 4’’ screen displays large numbers that can be easily read from far. Its battery powered and has a low battery indicator. Better yet, the wireless outdoor sensors can give you up to three readings allowing you to monitor multiple areas simultaneously. The package includes a transmitter, a receiver, and 4 AAA batteries. The fancy round shape with a beautiful black and silver color is the highlight of this hygrometer designed to provide you with accuracy for a long period of time. Measuring 1.75 inches, this hygrometer has a +/- 2% RH accuracy and measures humidity up to 95%. It also registers temperature readings in both Fahrenheit and degrees Celsius. In super thin cabinet design, this exquisite digital hygro-thermometer is convenient and can be easily carried around to simultaneously display humidity and temperature readings. It can also record the maximum and minimum readings and switch between Celsius and Fahrenheit readings. It can pick temperature readings in the range of 23 and 122°F and humidity measuring a range of 30%RH~90%RH. Loaded with loads of features, this gadget doubles as a hygrometer and thermometer for accurate indoor readings of humidity and temperature. Its LCD display makes it easy to read even from far and displays both Fahrenheit and Celsius temperature readings. It’s also designed to record the maximum and minimum readings with a wide temperature range of 32.0℉ to 122.0℉（0.0℃~50.0℃) with an accuracy of ±2℉. For humidity, the range is 20% to 95% with an accuracy of approximately ±5%. The comfort level indicators clearly display comfortable, wet and normal dry to help you comfortably monitor the humidity. It also has three functional buttons where one is for switching between Celsius and Fahrenheit, the reset button and a clear/max/min button. To operate, it needs one AAA battery that’s easy to install. It also comes with several mounting options where you can hang it on the wall, place it on a desk or mount it using a magnet. Get to monitor your indoor temperatures and humidity using this digital display hygro-thermometer. The gadget is characterized by highly accurate readings and a humidity range of 10% and 99%. It has buttons to switch between max and min records and Celsius to Fahrenheit. The gadget is portable and comes with one AAA batteries. Simple but effective is the best way to describe this battery powered hygrometer with a thermometer. It has a digital display unit with bold numbers that are visible even from a distance, giving a record of the indoor temperatures with a range of -58°F to 158°F. It also allows you to switch between Celsius and Fahrenheit. Wouldn’t it be nice to have a little weather station inside your home? That way you can effectively monitor different weather elements that if not checked can wreak havoc to your family. One instrument that you need not miss in your home is a hygrometer that helps measure the amount of humidity in the atmosphere. Knowing the moisture content in your home can help you take the necessary measures in case of high humidity that cause the growth of molds and even expose the kids to flu. When dealing with a hygrometer, there are two measurements that you will need to keep in mind: relative humidity and specific humidity. Relative Humidity (RH) is the easiest to measure and it gives the amount of water vapor in the air. It’s usually expressed as a percentage that gets higher as humidity increases. You will often find this figure displayed on most hygrometers alongside the temperature reading. Hair tension hygrometers – The principle of displacement is applied here where hair or nylon is used to determine expansion and contraction due to humidity. They are inexpensive and can’t be tampered with. Psychrometers – These are among the most common and match a pair of wet and dry bulbs. There’s usually a chart that compares the difference in temperature between the two gadgets. Mechanical hygrometers – Are often simple but expensive devices that have been used to measure humidity for decades. They can be mounted on walls or placed outdoors as meters. They require constant calibration to improve accuracy. Humidity range – Most hygrometers will give you a range of the percentage of RH that they can adequately measure. The range may fall between 0% for low humidity and 100% for high humidity. Display – It’s important for the gadget to have a good display that can be easily read at any time. Calibration – Since the humidity changes often, it’s important for the gadget to reset to capture the current readings or allow for manual calibration. Other features – There are numerous other features designed to enhance a hygrometer such as remote sensors, recording of max/min readings, an LCD backlight for night reading and having multiple mounting options. Your home requires a good hygrometer that will accurately measure the amount of humidity in the air. Whether it’s the basement, baby’s bedroom or even the kitchen, hygrometers are important for monitoring water vapor around your home or enterprise. Hopefully, this review has shed light on the best hygrometers out there and you will no longer use your imagination to estimate the amount of water vapor around you.